The radio phonic work ”una hora” deals with the change of time consciousness and the cultural effects in the society, hereby caused. The meridian – midday line – connects all places on the map, which have noon at the same time. 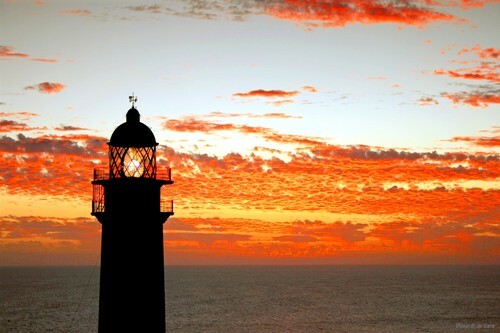 Till the end of the 19th century the Zero Line of Longitude of the earth ran near the Orchilla lighthouse, which lies on the Canary island El Hierro and which forms the most southern point of Europe. Worldwide all ships used this point for orientation and to specify their co-ordinates. 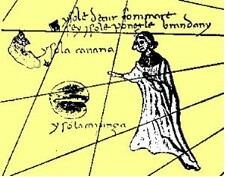 For sailors, El Hierro therefore was not an unknown island, but an important interface, which at that time connected Europe with the imaginary world. In 1884 the Orchilla time was changed into the Greenwich Mean Time (GMT) in England. 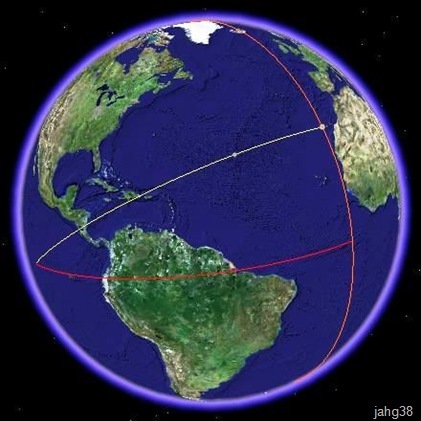 The Zero Line of Longitude ran and runs through “the primary transit” instrument (main telescope) at the Royal Observatory in Greenwich (near London). From here there are 180 meridians in eastern and western direction, which run parallel to the Zero Line of Longitude and 90 latitudes in the south and the north, which run parallel to the equator. The calibration and measuring point were thus shifted from the southern point of Europe, El Hierro, to England. The hegemony of England, which at that time governed the world market by ship and expanded its Commonwealth untiringly, was thus emphasised. 1. Following the book ”The Island of the day before” by Umberto Ecco stories are told of Roberto de la Grive and Padre Caspar Wanderdrossel. The shipwrecked and abandoned Roberto wants to solve the secret of the noises aboard, and behind the summerhouse of the birds he discovers a chamber full of clocks. His part is not shown with texts, but is characterised with sounds. Ecco describes Padre Caspar Wanderdrossel as a well-educated practical man who wants to solve the longitude problem. 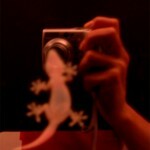 In ”una hora” he is the explorer, who wants to understand the change of time and its effects. 2. Based on the original proceedings a reporter describes the occurrences during the „Prime Meridian Conference“ held in Washington DC in 1884. Here the decision was made to move the Zero Meridian from El Hierro to Greenwich. Important are the comments made by the French delegates Mr. A. Lefaivre and Mr. P. Janssen, who opposed this decision. 3. On El Hierro, Luis Espinosa Krawany interviews the historian Baudilio Domingo Navarra Quintero about the change of the prime meridian. Some of the sounds, heard in the background, are recorded on El Hierro, like the high flute tones of the common kestrel, the gecko and the volcanic pipes near the village Echedo. You also hear three drum players. 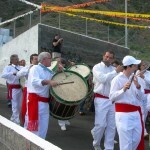 These specific drums are the original instruments used at festivals on El Hierro. The drum players play in front of the 8 kilometre long wall, the „Risco de Tibataje“. The rhythms are derived from the ancient Bajada melody, which can be heard on El Hierro every four years. The three dramatic tension arcs are intertwined with one another. 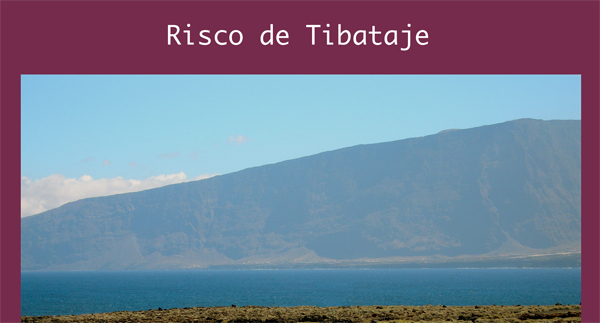 The sounds of the lighthouse and the “Tibataje rhythms” connect the parts. “Una hora” mediates time in the flow of events of past and present. “Una hora” is mainly conceived in Spanish. 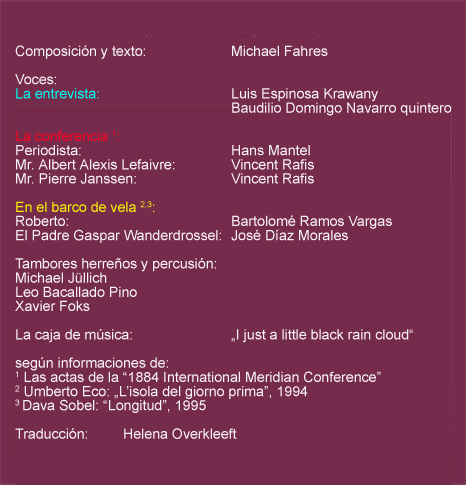 “Una hora” is a format 5.1 composed concert. For the radio broadcast a stereophonic version will be provided. “Una hora” is a radio phonic composition, which represents the historical perspectives as well as their interpretation in music and documentary (interviews). “Una hora” is a question and answer game in which the three drums respond to their own echoes. 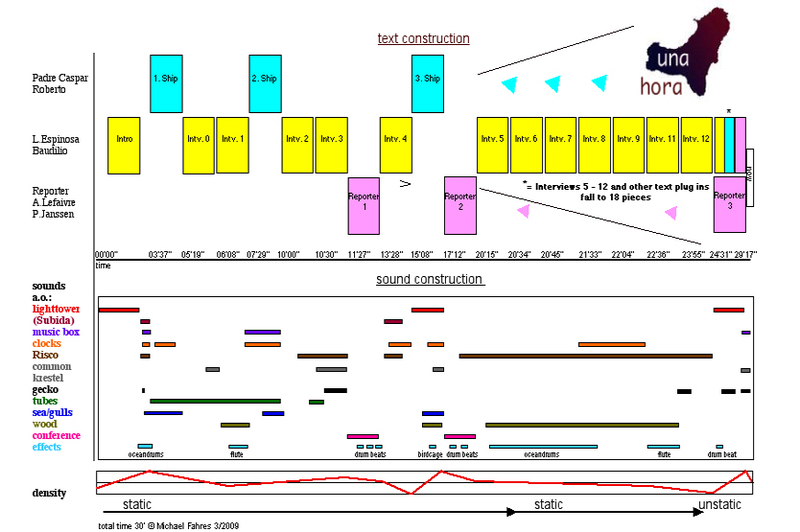 “Una hora” has 18 text parts and at the end falls into 18 pieces. 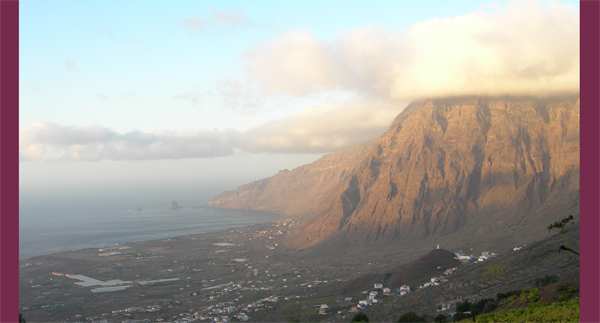 El Hierro lost 18 longitudes. Isla. Lava granulada de viaje, acaso la verdadera vida: la que permanece [lo otro, un proceso]. Un viaje épico de estrellas que vinieron en el primer alba a jugar al agua. Fueron del interior al viaje del exterior con tal brutalidad, que… se multiplican en su vuelo con nuevas estrellas. Conservan de aquello, sus rayos negros cristalizados, una estela fugaz materializada en luz negra, perlas negras, que en cualquier momento, vibran bajo los pies, en recuerdo de su viaje. Písalas, óyelas, huele su mineral, rómpelas y ábrela: mira dentro y atento a su chasquido. La isla, formada por las carnes de las estrellas rotas, acumuladas una sobre otra, forman nuestros nidos, nidos de estrellas atlánticas, nidos donde habitan seres atlánticos, jugando en el mar, esperando. Caminos de lava, estelas negras y sonoras, crujientes y chispeantes, luciérnagas y perfumes de luz: la estela fugaz es también sonora, tras el barco en el mar. Ayer fue reina en viaje cósmico, hoy somos la colmena que habita en su regazo, dormida [pero no tanto], jugando en el agua, nido Atlántico. La estrella, es negra cuando duerme, y suena cuando la despiertas. Sonido y fotografía tomados por Concha Jerez en la Fábrica Boxes & Cigars de Las Palmas de Gran Canaria en 2002. 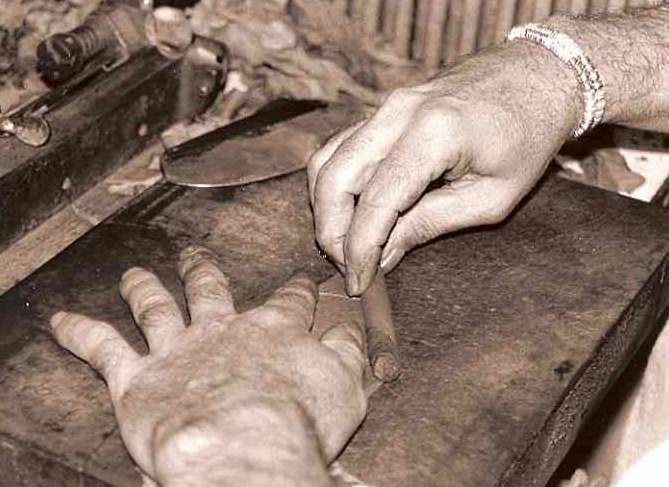 Sound and photo taken by Concha Jerez at Boxes & Cigars Tobacco Manufactures of Las Palmas de Gran Canaria in 2002. Fotografía de la C/ Triana en 1909. Autor: Ceferino Rocafort. 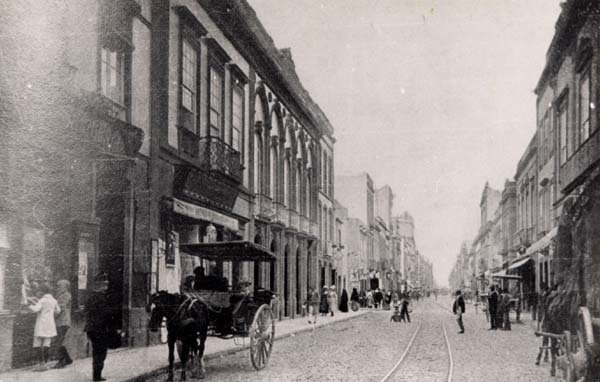 Photo of Triana Street made in 1909 by Ceferino Rocafort.